Can help change the world! 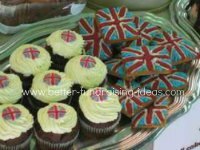 Bake sales have long been a staple of many groups fundraising activities particularly church and school groups. Volunteers and supporters of your cause bake and donate cakes, cookies, buns, muffins, pies and biscuits. These are then sold to raise funds. Easy to organise, set up and run they are a reliable fundraiser that can bring in a surprising amount of cash and raise your group's profile. Why are bake sales so popular? They are easy to understand - here are some cakes, buy some to raise money for our cause. They don't cost much to set up and run. They allow low level participation by time-strapped parents or those uncomfortable with more involved volunteering. Anyone can make a tray of cakes. They allow participation by a wide group of people. They can be a great social occasion that can really help bond your group and attract new volunteers. They can raise your group's profile or special cause. Buyers get something for supporting your group. A good bake sale with plenty of variety will usually have something for everyone. Its easy to involve kids and makes a great kids fundraiser. It can be a stand alone event, a stall at a fete or fair, or a quick table of cakes or walk round in a workplace. It can be tailored to specific events for instance Superbowl, Halloween, Christmas etc. It is a great way to very quickly raise some cash for emergency appeals be they local or national when you need to move fast as a particular issue comes to the fore. You really need to have one or two people in charge in order to plan and arrange for cake contributions. The first thing that should be agreed upon is the date of the sale and where. This can depend on a lot of other factors when making your plans. Some groups will be big enough to hold a stand alone event, for instance in a shopping mall or town centre (if permission can be obtained). 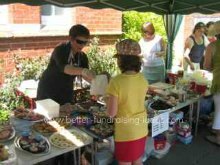 Other groups will combine their bake sale with other fundraising activities for instance a church fete or school summer fair. You might want to avoid clashing with other events such as national sporting occasions, public holidays, school holidays, elections etc. If you see a crowd sell them something! 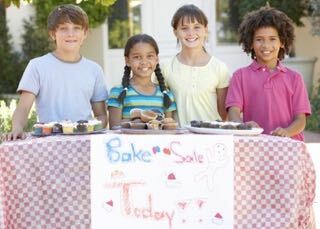 certain events might be a perfect opportunity for a crack team of bake sale volunteers to set up and make a fortune by piggybacking on a national or local event. Check local calendars, other charity events and church and school schedules to see where you might be able to spot an opportunity. The success of a bake sale depends of course on yummy cakes and cookies being made by your supporters. You need to ask them in good time. If your bake sale is to be quite big Do not rely simply on flyers and other publicity for contributions. A personal ask from the organiser will nearly always ensure that something is made and delivered. The organiser may like to also have a quick ring round a few days before the sale just to confirm and pass on details of where to deliver the cakes etc. Most people will be prepared to make cakes without being paid for ingredients. It is the job of the organiser however to ensure that people on a restricted budget are not disadvantaged. A personal invitation also allows the organiser to keep an eye on who is baking what and avoid too much duplication. Though some kids may feel you can never have too many chocolate krispie cakes! 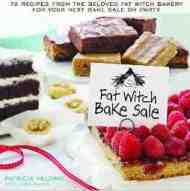 There are lots of bake sale recipe books available. This is one of our favourites. The whole essence of a bake sale is that the goods should really be home-made rather than shop bought. In many ways that is what people are buying into, the fact that someone has put something of themselves into the event. In a commercial world this is how your event, and cakes on offer can stand out. This is your decision and depends on your group's situation and resources. You will get better results however with home-made rather than shop-bought offerings. Hopefully you have chosen a good location with plenty of footfall. Use flyers, posters, A boards etc to send people your way. 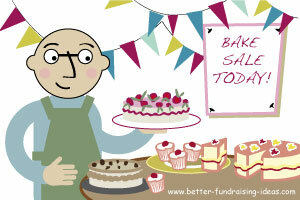 Don't forget also that a bake sale is a great opportunity to raise the profile of your group or cause. You may like to invite the local press to the event (make sure they arrive before too many cakes are sold). If you are doing this try to find a good angle ie Local children raise funds for earthquake victims etc. Don't forget either to take photos of your stall (and volunteers manning it) yourself for your own publicity, newsletter, website etc. As with so many things presentation is everything. Paying attention to the small details is important. Your cakes are unique, home-made and a really special treat. Presenting them as beautifully as possible allows you to show them off as that and….charge just that little bit more! Tables - These need to be reasonably sturdy to bear the weight of your (hopefully) enormous array of offerings. Also people do press up against the front of the stall etc. Table cloths - Plates of home-made cakes need to be shown off properly. Plates - Once more it is so important to do these properly have plenty of nice china plates and cake stands to display your wares. Knives, cake slicers and tongs. - To cut and pop cakes onto plates or into bags. Paper or china plates and serviettes - Some people will want to eat their purchase there and then. Paper bags or plastic freezer bags. To sell cakes to take home. Pricing labels or a blackboard. Description labels - To avoid those "Looks nice but what is it?" moments! A big sign that says who you are and what you are collecting for. You also need to have enough volunteers to man the stall. You might want to arrange a shift system particularly at an event where your volunteers may also like to have a look around themselves. Not as silly as it sounds; giving your cakes good names can increase sales, prices and the sense of fun at your event. So rather than a glum looking notice announcing fairy cakes - 30p try something like Sebastian's Special Fairy Wonders! Rather than Victoria Sponge how about Victoria's Secret Passion. Rather than Brownies how about Brownie Delights. Rather than currant buns how about Susan's Sultana Sensations. You may like to add a local angle how about West Street Wonders or Blue Mountain Rocky Roads. Sports teams might also like to have cakes iced in their colours etc. It really is time for a bit of imagination Get the thesaurus out. 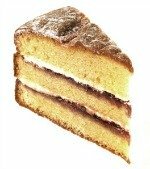 With larger sponges you may be able to sell the complete cake to take home rather than individual slices. Towards the end of your sale drop your prices and increase your deals in order to not be left with too much stock. If your sale is part of a larger event left over bigger cakes can also be auctioned towards the end of the day. Why just sell someone a slice of cake when you could also sell them a cup of tea, coffee or even an entire strawberry cream tea. Look for ways to offer anything extra that will make you extra cash. Recipe cards or charity cookbooks are another money-making opportunity. You can also look for ways to make your cake stall just that bit more exciting. How about having your volunteers in fancy dress. Home-made cake related hats (this is also a great way to have a bit of fun for your volunteers as they try to out-do each other). Wear your uniforms. If you are a member of a team or squad, such as cheerleaders, wear your uniforms, team strip. Ice your own stalls are a great way to keep the kids busy and "creative"
As always make sure that you thank your volunteers both those who baked and those who manned the stall. Announce the total raised as soon as possible. Then of course its time for feet up, a cup of tea and....a nice piece of cake! Do you know any great bake sale recipes? Share them with other people around the world.